To whip up a successful HIT implementation, several key ingredients must be on hand. Large-scale HIT transformations are among the most substantial projects organizations can undertake—and perhaps the most financially risky. These complex efforts affect every individual and department across the facility. Farrell Sanders, MBA, senior vice president of consulting and application services at Cerner, believes a successful implementation meets expectations in terms of value achievement, user experience, system performance and capabilities, and project cost and timeline. "To that end, it's important that health care organizations have upfront conversations with their suppliers about their goals and outcomes they'd like to achieve," he says. Planning is another factor that can determine a project's success. "Preimplementation planning is crucial," says Lydon Neumann, vice president at Impact Advisors. "Organizations need to plan or model the entire project, including the basic assumptions and proposed budget with all anticipated components and their associated costs identified. For instance, cost modeling becomes critical in terms of the project definition, which is impacted by the speed and timing of the planned rollout; the number, skills, and expertise of required resources; and the defined scope—what's in and what's out of scope. Oftentimes, facilities are replacing scores of systems with a single integrated system. So, whether legacy systems are to be replaced or not, their costs will need to be accounted for." • What is the project's overall scope, and which modules are being implemented? • What departments are participating, and which systems may be retained or sunsetted? • What is the overall timeline and speed of deployment throughout the entire enterprise? • What full-time and part-time resources are required internally and externally, including the vendor's role and responsibilities? "The project's scope defines its impact across the organization and what expectations are communicated," Neumann says. "An organization will need to understand and be realistic about the time the project will take and what resources will be required in this time frame. Often, organizations undertake something of this scale or magnitude for the first time and may fail to appreciate everything the project will entail." Henry Grady, who heads SunTrust Bank's Healthcare Industry Specialty Group, agrees, pointing out that HIT projects are expensive and comprehensive undertakings for most medical practices and facilities. He, too, believes that in the early stages of planning, organizations must consider the project's scope and what technology will remain once the new technology is implemented. "They also have to consider how well the new technology will integrate with any existing technology," Grady says. "Over the years, software solutions have stacked on one another. In such cases, they all have had to work together and talk to one another. It's the integration of technology in medicine that is now being either replaced or rejuvenated, and it is in that refurbishment that everything must continue to stay connected." According to Lesley Kadlec, MA, RHIA, CHDA, director of HIM practice excellence with AHIMA, the right people must be involved when it comes to making vital decisions on items such as software selection. "From an HIM director's standpoint, being at the table from the get-go when upper management is making their selection so that they understand what is needed from a documentation standpoint is critical," she says. "The vendor needs to meet your needs. Therefore, all project stakeholders need to be involved." Grady echoes Kadlec's opinion, adding, "Another component you have to address at the beginning are the doctors and how willing they are to change and embrace those systems. You have to have medical professionals involved right at the beginning, particularly because the medical record piece is driven by the doctors' side. Not only do physicians have to be comfortable with the new technology but they also have to champion it. If you don't have physician buy-in, particularly in the early stages, then the project is more likely to fail." Along with stakeholder support and involvement, understanding how work flows across the entire organization is crucial. When a new system is adopted, this component—particularly for physicians and nurses—can be greatly impacted. "It's important to do workflow mapping," Kadlec says. "And we need to do it in two ways: 'as-is' and 'to-be.' Then we bring in the vendor to replicate and improve the as-is workflow so that it becomes the to-be workflow. In this way, the vendor can understand how your workplace is different from that of other organizations." Kadlec cites the example of a clinic with overnight fasting patients who arrive the day before their appointments for blood work. On the day of the appointment, physicians needed to access the previous day's test results in order to proceed, but the existing software wouldn't allow documentation until the patient actually arrived at the clinic for the in-person appointment. Therefore, the preappointment lab results were not available for the physician visit. "The vendor's other clients didn't require that capability, so we had to ask the vendor to customize the software in order for the information to be available and the workflow to proceed as the clinic needed," Kadlec says. "And that is an important question to ask: Are you able to replicate what you need to do in your organization with the software you choose? To get a full grasp of the answer to this question, I can't underestimate the importance of having all the stakeholders included at the start of the planning process." Neumann believes organizations often make the error of overstating the value of their projects in the short term while understating their long-term value, a thought process that can lead to project frustration or disappointment with immediate results. "Organizations need to appreciate that the greater value of an HIT transformation is over time. If you are only doing one system, like a lab, that's one thing. But if it's an entire core system, which is likely to change workflows, they will need to consider other factors beyond just system functionality. You may be essentially rewiring the virtual nervous system of an entire organization," he says. Resistance to new technology can be another significant hurdle. "Staff members may resist the new technology because they don't understand its value. This is where executive sponsorship is crucial," Neumann says. "For many organizations this may be an enterprisewide transformation, which is supported by IT and IT project management. Any large-scale transformation needs to be owned by the executive suite and senior leadership. In this case, most everyone in the organization needs to gain an understanding of the entire project and what the staff will need from the new technology to help them be successful. Without proper planning and this overall understanding, a project may understate the skill sets and expertise required for the successful implementation of new technology. For instance, revenue cycle can be an opportunity for improvement, so there needs to be a strong dialogue between the billing and clinical departments. Historically, they have operated more independently, but with more integrated systems, that is no longer the case." Neumann says physicians and nurses need to understand that some workflows and processes will likely change. "As an example, it's mandated to have a computer-generated record, and that puts greater demands on the doctors and their time, as they are doing more within a new EMR. It's what meaningful use goals and incentives are trying to drive," he says. "The system may be pushing them into directions that people may not immediately grasp the impact of. As a result, organizations may underestimate the demand placed on physicians. This tends to shift more of the burden of adoption to the most highly trained providers, who may be resistant to that change." Cost is an enormous obstacle. "I've seen hospitals spend $1 billion on a single EMR platform in national health care systems," Grady says. "In regional systems, they could spend upward of $100 million. Will it make them more efficient and portable as well as unique among peers and similar across systems? Yes, but it pushes the organization's payback down the road quite a way. It could take decades to recoup that cost." Kadlec says technology is a long-term investment with limited immediate return, and organizations need to allow time to realize a return on investment. She believes health care facilities can make hasty decisions without fully understanding what they are getting when they purchase new technology. "You can end up with packages that lack some of the functionality for what you actually need," Kadlec says. "And some things are difficult to put a dollar value on," she continues. "How do you put a dollar value on patients having access to a portal, being able to get copies of records online, or being able to send a question to their physicians 24/7? It's hard to see and hard to quantify. We really want to see that money, that black and white. Many of the benefits of technology are a little more intrinsic than that, but they still have positive outcomes; they are still an investment. While necessary, being able to see the bigger picture can sometimes be difficult." Technology that is hard to come by can be yet another barrier to success. If a practice's or a facility's situation is complex and/or features variable workflows, it can be difficult to obtain the functionality they require. "A case in point is an eye clinic that creates drawings to show where an issue is within the eye. They would need a stylus and the capability to use it as part of their software technology, but that may not be easy for a vendor to provide," Kadlec says. "Again, this is why it's important to have stakeholders at the table, looking at the existing workflows. That way they are not completely making over the system but making it customizable. Vendors have to provide something that will allow practices and hospitals to do their work without completely needing to reinvent the wheel." Along with assessing workflow and including stakeholders in the decision-making process, Kadlec believes that implementing a governance structure can help ensure an HIT project's success. "Making sure you have a committee set up looking at updates to the system and taking requests for changes in security access is critical," she says. "We had a committee in one of my previous organizations comprising a multistakeholder group that was looking at access requests. They could give permission for access or deny it with an explanation. This also helps with other upgrades that were previously not anticipated. You may need scanning capability in your EMR, and you need software to do that. The governance structure can have executive oversight and processes in place to keep everything running smoothly." Kadlec believes the absence of such a group can impact both workflow and finances. "If you have to resort to another storage methodology because you can't scan, for example, and you have to put that information on a disparate system, it's going to have an impact on patient care, workflows, and the bottom line," she says. Sanders concurs, adding, "Health care organizations need to think of an implementation as more than an IT project, and having a governance structure is essential to the success of a project." To help select the proper vendor and software, Kadlec recommends visiting other facilities to test the proposed system, going on walk-throughs, and obtaining references. "Also, don't assume the vendor knows what you do at your facility," she says. "When you do site visits, have the vendor with you so they can experience the new technology as you're using it." Both Sanders and Kadlec say that having individuals within the organization armed with tools to identify issues and opportunities can facilitate adoption and improve the chances of success. "Identify staff for whom you can provide extra training so they can help assess how the system works. You can't always rely on IT to get into the system right away when a problem comes up, and these 'super users' can often help solve problems quickly," Kadlec says. Neumann believes that because health care is becoming more collaborative as the industry evolves, everything must work together in order for technology to be embraced and used correctly. "It's no longer effective to solve problems in each department or area independently," he explains. "Health care, as an industry, was highly fragmented in the past. There were hospitals and physicians. What happened in billing was different from what happened in the emergency department. But that has all changed. Now the systems have to integrate and work together. Health professionals readily understand there are better outcomes for their patients when they work collaboratively." If organizational leaders are out of sync, the project can run astray. "In a hospital we advised, operations decisions were led by IT, but the IT team didn't fully comprehend what operations needed," Neumann says. "This was delaying the implementation and, as a result, the organization would have incurred additional costs to remediate the problem." Grady notes that organizations need to fully understand what they require and design a cost strategy around those needs. "Not every organization needs a Cadillac," he says. "There are great solutions that fit with smaller health care providers. There are also solutions that are better fits and farther down the continuum that are not quite as costly. With new technology, the overall cost is coming down as these solutions are becoming more cost effective and mainstream. If an organization can be patient, it can afford a system that is bigger and better than initially thought." As part of the planning phase, organizations can also look at existing research to see what would be of the most benefit. The Pew Charitable Trusts develops policies to support the development of data. "Hospitals can use the information when purchasing new technology," says Ben Moscovitch, MA, HIT manager at The Pew Charitable Trusts. 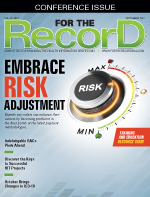 "EMRs have the potential to improve safety and reduce costs. Therefore, hospitals and EMR vendors must be able to collaborate as they design new technology to meet those goals. Pew supports the establishment of a health IT safety collaborative to enable collaboration among hospitals and vendors." Neumann says organizations should dive into all the information pertinent to the project at hand. "Everything that is relevant and available should be examined before launching a new HIT project," he says. "But most importantly, when it comes to ensuring overall success, organizations should do three important things: plan, plan, and plan."